The Omaha videos are up! This video of our clapping sequence is our current favorite. Click over to our Vimeo channel to see the rest from the Omaha set! In the last few days, K A T E S has each flown almost exactly halfway across the country, explored Omaha, made new friends, spent time with old ones, seen TONS of new music-theater-dance, AND performed together for the first time in over two years - what a week! Huge thanks goes out to Omaha Under the Radar for including us in their wonderful, growing, vibrant festival. Here are some snapshots of the week - we'll share more polished photos and video in the coming weeks. It's Omaha Under the Radar, y'all. Info on Bancroft Street Market here. Tickets here. We've all been in this situation - it's time to revamp the choreography for Ryan Brown's short piano piece "Buckle" and the performance is just a month away, but you're tapped out of ideas. Sigh. Fortunately, Jack Kerouac is there for you. Just crack open Dharma Bums, choose one heartbreakingly beautiful sentence, and then hang movement on the words like so many brilliant ornaments on a Christmas tree. Nestle the dance into the music. Pour one out for JK and the boys and thank heaven ideas are infinite. P.S. - Omaha Under the Radar starts in a month and a day. Yes. It's not every day you find beer that matches your music. By the way, Ryan Brown's Cellar Door is on our Omaha Under the Radar Set! We better drink up - er, practice. The long, long break is finally over. 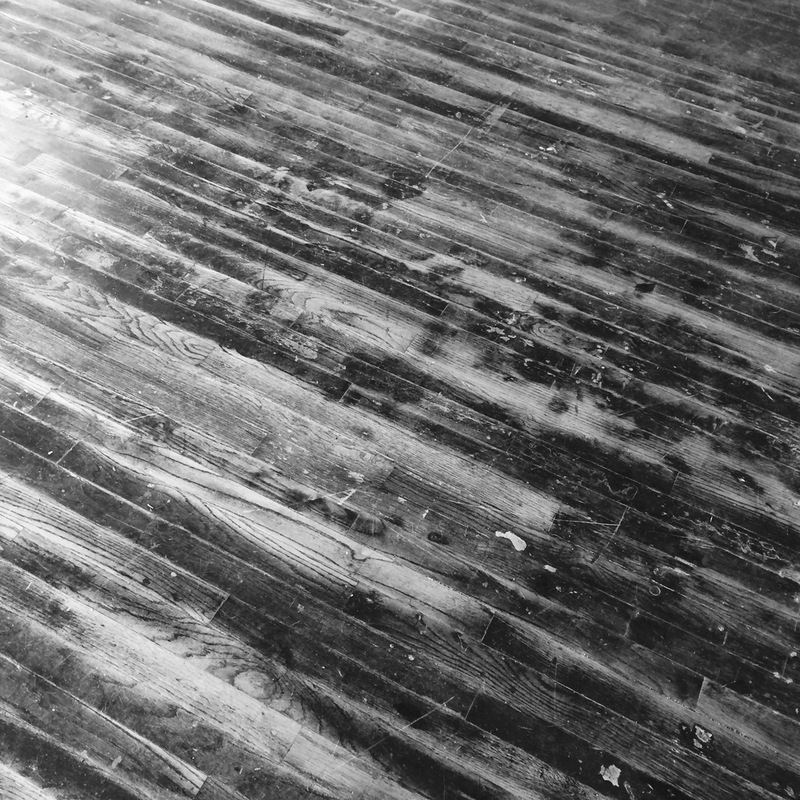 The K A T E S winter is thawing. Maybe most exciting (for her, at least) is that Katelyn Halpern is California-bound for some good old dancing/strumming/clapping/piano-plinking rehearsal. Yes - you guessed it! We are getting the band back together. The performance - our first in 2 years - is still TBA per the organizer's request, so although we can't disclose all the details, we can say it's happening this summer in a fantastic city with loads of talented co-performers. That's all for now - more updates to come from sunny Oakland. This summer each of us Kates is doing something pretty big. Kate Campbell is moving back to her spiritual homeland of California, and Katelyn Halpern is getting married and continuing on the not-as-spiritual journey of teaching high school. It's hard to hand-clap across three thousand miles, so there won't be any news for awhile. Whenever there is some again, though, this is where it'll be. Keep up with Kate Campbell here on her website. Last night we had the pleasure of performing at The Flea's Dance Conversations festival. Working with the Flea was fantastic. Case in point - they dissembled the piano twice (!!) for us: once to get it on stage before tech, and again to get it off stage for the act that followed us. If only we had a picture to share of the crew performing that feat of strength. Then after, of course, we had the dance conversation. We took questions along with the other performers and choreographers, mostly about our collaboration, friendship, and how we play off each other. For more info about the show, click here. Just in Case You Forgot... The Flea is Coming! Don't you want to see us do whatever this is on June 6?! We think you do. Many thanks to NYsoundCircuit for hosting us on Strings in Motion last night. What a fun, big night in a big, gorgeous room! Find more information about the concert here. Strings in Motion - This Weekend! We're rehearsing up a storm, so we'll keep it short - NYsoundCircuit's "Strings in Motion" concert is this weekend on Saturday, March 16. We hope to see you and yours there! Another fun year at the New Music Bake Sale. Cheesier than last year, but just as sticker-y. Come see us again @ the New Music Bake Sale! In the run-up to our spring performances, we're heading back to the New Music Bake Sale! It's Sunday, March 3, and we'll be sticking stickers and grilling grilled cheese sandwiches. Come see us! At least as much food, beer, and music as last year - maybe even more! Upcoming Performances - 2 of 'Em! Little break over - we're performing TWICE this spring in the Big Apple! On March 16, NYsoundCircuit is hosting us on their "Strings in Motion" concert at the DiMenna Center. On June 6, we'll be hosted by The Flea theater as part of their Dance Conversations festival. Mark your calendars, and we'll see you there! K A T E S is taking a little break. Over the next couple of seasons, Katelyn will focus on attending Teach For America's summer institute and then starting her first year of teaching in Newark, NJ. 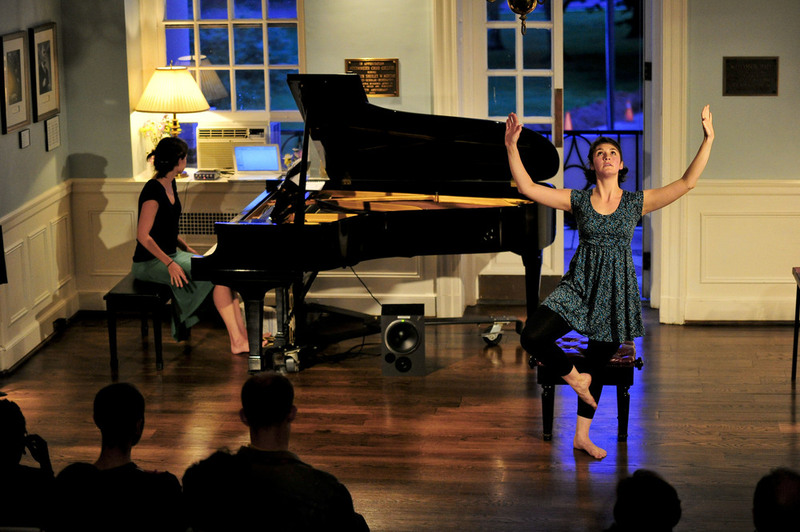 Kate will continue performing and teaching from her home-base in Princeton, NJ. 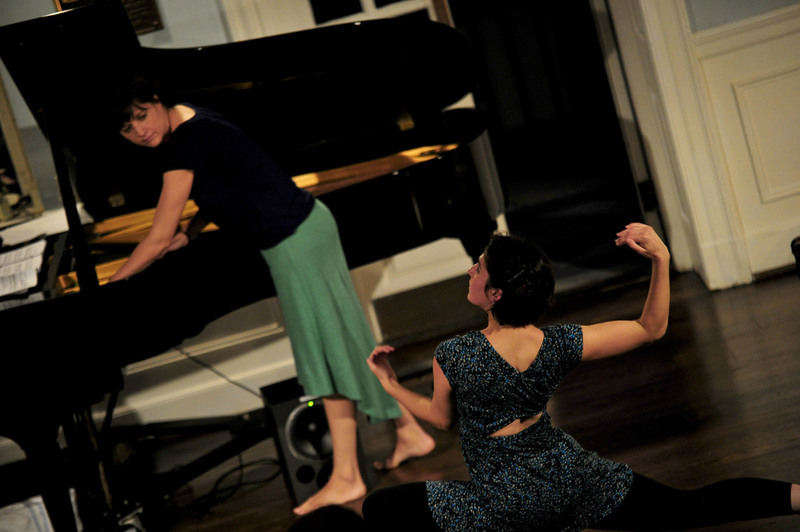 Photos from "Whistling, or Just After"